The day began with a light Westerly breeze over the houses and dark clouds in the sky, but as racing started the wind swung progressively North West and increased in strength and the sunshine broke through the clouds to ensure that a good day of competitive racing was enjoyed by all. A+ rigs were used by all throughout the event. 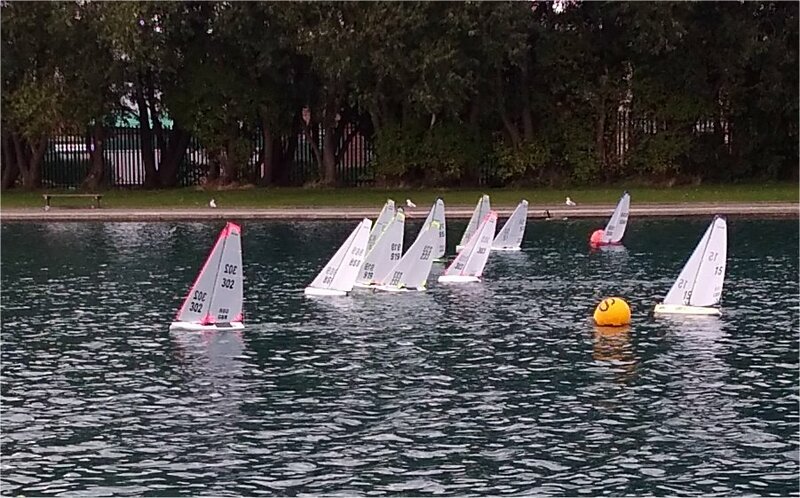 Excellent behaviour was observed by all of the competitors with no protests needed and turns being promptly done on the rare occasions when there were contact between boats. It was no surprise to see John Tushingham come in as overall winner, but once again he didn’t have things all his own way with no less than 5 different skippers winning races during the day. Local sailor John Brierley came second with Dave Darwell from Askern taking third place overall. Huge thanks as always to the Birkenhead Race team of Martin, Bernie, Jack and Judith for the smooth running of the event and the endless supply of tea and coffee.